Leben = Physik + Chemie? What is „life“? How could it originate and evolve to greater complexity? What is the relationship between mind and matter? Are there special laws that govern living matter? Or is living matter completely reducible to the laws of phyiscs and chemistry? 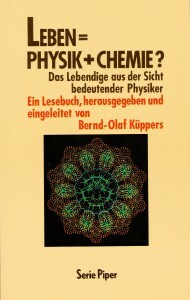 These and similar questions arise from the the title question of this book „Life = physics + chemistry?“. This anthology is a collection of writings by famous physicists of the 20th. century. It gives an impression of the fascination which living matter has exercised upon natural scientists at all times. With an introduction by Bernd-Olaf Küppers.